Why do we discipline? What is the point of our child-training efforts? It’s not ultimately about good behavior. It’s not about the convenience of having well-behaved children. It’s certainly not about giving out just deserts when children make mistakes. Our first goal as parents should be shepherding our children into their own personal, growing, relationship with God. As God’s representatives to our children during their early years, we’re part of God’s plan to bring our children into a saving relationship with Him and begin walking the path of Christian growth and maturity. When we discipline, we’re helping our children see themselves and their behavior in light of God’s Word and then showing them the godly path forward. 1. Our children are simple and have much to learn. 2. Teaching God’s Word to our children is one of our most primary tasks as Christian parents. 3. God’s Word is powerful to teach the truth and accomplish positive, heart-level change in people’s lives. 4. Instruction has the potential to reach our children’s hearts. Discipline administered without instruction (such as merely punishing or requiring an apology) may change our children’s outward behavior, but it does not help our children grow. In Shepherding a Child’s Heart, Tedd Tripp points out that we often reduce parenting to setting rules and then meting out consequences when those rules are broken. While consequences have their place, there is much more to godly discipline. Tripp says our child-training should be characterized by “rich, full communication” — words of encouragement, correction, rebuke, entreaty, instruction, warning, teaching, and prayer. 5. Instruction helps us connect our children and their behavior to the gospel of Jesus Christ. 6. Knowing and walking in God’s Word will be a source of tremendous blessing to our children. So how do we make instruction an important part of our discipline? We can make the effort to look beyond our child’s behavior and discern the attitude of his heart. This may mean taking time to talk, ask questions, and listen until you learn his trust and understand his motives. We should be ready to apply Scripture to their situation, whatever it may be. Show them what God’s Word says. This means we need to know our Bibles! Some discipline issues are not necessarily sin issues. At times, our children will make honest mistakes or exhibit immaturity typical for their age. In these cases, they may need instruction, but no further discipline. As we instruct our children, we want to avoid “lecturing” to the point of frustrating them or leading them to tune us out. We should be able to succinctly explain what was wrong and what should be done differently in the future. Instruction from God’s Word is not just for when our children misbehave. We can teach our children stories and other truths from the Bible throughout the day. Scripture should form the underlying foundation of our family life and of our children’s education as they grow. Finally, as we instruct our children, let’s remember that it’s for their growth and for God’s glory. P.S. 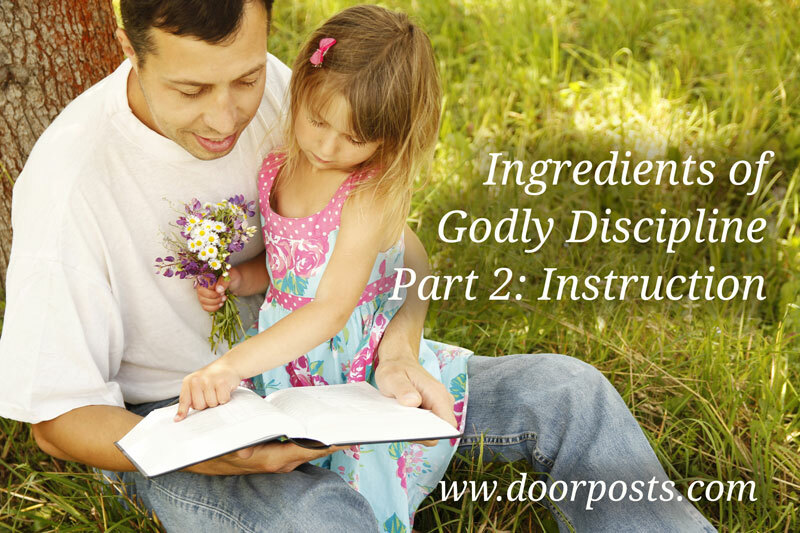 We’re still celebrating “launch week” for our new chart, Ingredients of Godly Discipline. Through this Wednesday, 8/19, you can choose a free bonus along with your chart!